Bassam Saba is among the most creative and influential figures in today’s Arabic music. Born in Lebanon, and now based in New York, Bassam has deep roots in Arabic tradition, a profound knowledge of Western classical music, and a feeling for jazz and pop?in all, breadth his musical forebears could scarcely have imagined. Bassam plays accordion, violin, oud, the Turkish saz and the buzuq?long-necked lute of the nomadic Arabs?but his specialty is the flute, and its wooden, Arabic ancestor, the ney. He has worked with artists ranging from Yo Yo Ma, Sarah Brightman to Alecia Keyes, from Quincy Jones to superstars of North Africa and the Middle East?Fairouz/Rabanni The most renowned Diva of the Arab World, Majida Al Roumi, Marcel Khalife of Lebanon, Khaled of Algeria, Souad Massi and Kazem al Saher of Iraq. His most important collaborator in recent years also ranks among of the most influential and revolutionary figures in contemporary Arabic music, Simon Shaheen. For years, Shaheen has been urging Bassam to form his own group, and give the world his unique distillation of these diverse experiences. Now, with his new group, the Bassam Saba & Ensemble, this brilliant creator at last takes center stage. Bassam grew up in the north of Lebanon, near Tripoli. His father was a talented, amateur musician who raised Bassam and his older brothers in an intensely musical environment. The father loved Russian and Turkish folk melodies, and passed on to his sons a refined sensitivity to the subtle distinctions between Turkish, Arabic, Kurdish, and Western tonalities, as well as a profound sense of history, and its interrelation with music. From the age of five, Bassam took on “everything at once,” accordion, violin, ney, oud and more. He recalls, “My hands were always on the instruments.” Saba first formal studies began at a very early age as a child protegee studying at Lebanese National Conservatory. Bassam was 15 when war came to Lebanon in 1975. He had barely tasted the city’s richly artistic, cosmopolitan heyday, but the spirit of that time would remain with him always as he began a life of travel. 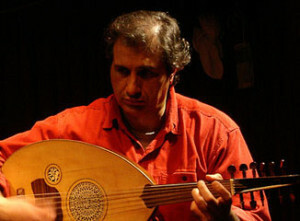 Already, Bassam was developing a unique, personal style on the Western flute, incorporating the ornamentations and microtonalities of Arabic music, especially in his improvisations. He developed his ideas further when he went to study in Moscow from 1979-85. The Moscow Conservatory was “a dream?unbelievable, the discipline and the way of teaching?not only music, but history, philosophy, aesthetics?” For his Master’s dissertation, Bassam wrote an innovative method book for the ney, applying notions of breathing, vibrato, and tonguing from his study of Western music. The work was so well received, that it earned him the chance to stay three more years, and complete his doctorate there. These ideas have helped guide a new generation of ney players, worldwide. From Moscow, Bassam returned to Lebanon, where he was appointed conductor of the Beirut Symphonic Band. Over the next four years, he resumed work with Marcel Khalife, and participated in groundbreaking, cross-genre performances and recording with one of the most adventurous musicians on the Beirut scene, pianist and composer Ziad Rahbani, son of the vocal legend Fairuz. The war continually interrupted his work, and by the time it ended in 1990, Bassam was again looking to new horizons. He passed up a scholarship in Rome to come to the United States in 1990, and a year later, came to New York, where he met Simon Shaheen. “We got along from our first meeting,” recalls Bassam. “Simon was looking for people like me who played Arabic instruments and had a background in academia. We talked music, and found that we thought very similarly. Two weeks after the meeting, he took me to Detroit, and since then, I’ve been with him.” At the time, Shaheen was concentrating on his Near Eastern Music Ensemble, a group dedicated to showcasing instrumental music in a world that had mostly revolved around vocalists. He instantly recognized that Bassam had something special, and began encouraging him to further develop his approach to the flute and ney. The two began to create together, and their experimental collaborations helped inspire Shaheen to venture into the world of fusing jazz and classical music. Out of these experiences, Bassam became a star of Shaheen’s landmark, genre-bending ensemble, Qantara. In Rome the year prior, Bassam worked with producers Quincy Jones and Dawn Elder on a mega-concert, playing on an electrifying, live collaboration between Karina Pasian and Kazem al Saher. After that, many international celebrity artists sought Bassam out, as did Alecia Keyes as she set to recording her latest album inspired by her musical explorations in Cairo. Saba’s musical career also includes live concert broadcasts and radio interviews aired in France, Belgium, Lebanon, Japan, Canada, and the U.S. and have toured throughout the Middle East, Europe, Canada, South America, Australia, Africa and Japan. In 2005 Saba was recognized by the National Arab American Museum as one of the 10 most outstanding artist of the last decade to make a significant difference in bringing the beauty and rich cultural history of Middle East through music to American Audiences. Bassam tried his hand at band leading just once before, with a group called Myriad in 1996. The CD they produced, Soukoun, meaning “stillness,” brought together a range of diverse elements, including piano, percussion, and piccolo. Bassam’s composition “Let’s Walk to the Moon” recalled his childhood when his parents would take the family on evening walks through the olive trees towards the rising full moon. To bring in a Turkish element?his father in mind?Bassam learned to play the saz in one week, composed music in a night, and recorded the song in 20 minutes. Although Myriad was short lived, the idea of leading a group stayed with Bassam. Saba is currently directing the Middle Eastern Ensemble at Harvard University and a student Arabic Orchestra for New York University. ?In late 2006, he created an ensemble that would best suit his music? The ensemble features numerous luminary musicians on world percussions, classical and traditional Arabic strings, and contra bass. As he prepares his debut recording the Bassam Saba Ensemble promises to open still new frontiers in contemporary Arabic music. Saba has recently released a self entitled CD and continues to perform both with his ensemble as well as collaborate in performances with numerous master musicians and composers at some of the world top venues.